Ocean9 accelerates digital transformation with high performance cloud services for SAP on Amazon Web Services (AWS) and Microsoft Azure. 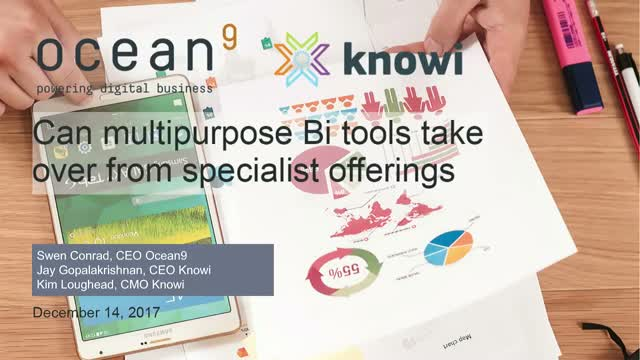 With a minimum of effort, Ocean9’s Intelligent Automation and Architecture allows customers and partners to provision SAP HANA in just minutes – and then quickly transition from development to mission critical operations with business continuity and availability of up to 99.99%. Flexible Ocean9 subscription licensing, meanwhile, eliminates investment risk. The analytics space has been very fragmented in the past through a delineation of tools across the various steps in the data preparation and consumption cycle. With an increasing need for real time analytic speed and the abundance of different data sources, more universal offerings are simplifying and accelerating the time from data to insights and action. Join this webinar to learn about the latest trends and offerings for real time analytics and get a head start for your BI analytics architecture planning in 2018. Successful digital transformation is tied to data streams in and out of the enterprise and monetization via new types of services. Data analytics are an inherent element that will power all new apps and automate actions based on real-time data analysis. In the years ahead, data driven actions will become more and more sophisticated and will augment work activities and support consumers when they shop, trade, and make decisions. Join this webinar for a discussion of these trends and to understand how with the increasing speed of innovation and the growing scarcity of resources, leveraging adaptable on-demand infrastructure and platforms will grow in importance and become mainstream. Fraunhofer Institute, a leading German research organization, identified 30% of virtual machines sampled on a leading public cloud were vulnerable to attack due to incorrect configurations by the user. The article further states: "The problem clearly lies in the customers’ unawareness and not in Amazon Web Services." With the long list of existing cloud services and the rapid innovation of new cloud services, how can you make sure to engineer security and reliability into your cloud solutions from the get go? Frank Stienhans is an early cloud adopter and CTO of Ocean9. He is fluent on both Azure and AWS and concepts and examples will cover both clouds. The majority of big data technologies emphasizes the technical significance of new concepts like clustered file systems or in-memory computing. While such technologies are highly relevant for certain big data aspects, they obscure a holistic look at the overall needs for data management and data lifecycle in accordance with the business use case. With the Data Lake, this is different: Semantically grouped managed data objects are at the heart of this new paradigm, with a variety of technologies supporting it. With all the talk about the unimaginable growth of data, lets make data and its elements the core of our future architecture. Join this webinar to understand key data lake concepts as well as best practices on how to get started. Experts agree, companies and their IT departments will be living in a hybrid world for many years to come. While cloud as the de facto default for deployment will become the standard soon, most organizations will retain a group of applications on-premise out of a variety of reasons: LIfecycle or age of the infrastructure and application asset, technical specifics making a migration challenging or lastly security concerns in highly regulated industries or in core areas of a company. This means that IT Ops will have to evolve from being an expert in several technologies and applications to being an orchestrator and facilitator of a changing variety of resources spanning on-premise as well as one to several public clouds. Join this webinar to understand how to respond to ongoing cloud migration in a hybrid cloud world across the three dimensions of (1) leadership and management, (2) process and policy, and (3) tools and systems. Modernizing Legacy Applications: To Containerize or Not to Containerize? The adoption and popularity of containerized applications has exploded in recent years. According to Gartner, more than 50% of new workloads will be deployed in containers by 2018. But where does that leave the other 50%? How are virtual machines measuring up and how will applications built on these infrastructures survive the digital transformation caused by Docker and other container platforms? Join this expert panel discussion with Fabio Gomez, Cloud Solution Architect- CASE, IBM, Tarak Modi, President & CTO of TekNirvana, Swen Conrad, CEO of Ocean9, and Phil Mullan, Head of Engineering at Huddle, to discuss which IT infrastructure makes the most sense for your business in the digital age, and the pros and cons of different operating systems. Hardware Virtualization and Cloud Computing allowed us to increase Resource Utilization and increase our flexibility to respond to business demand. Docker Containers are the next quantum leap - Are they?! Databases always represented an additional set of challenges unique to running workloads requiring a maximum of I/O, network, CPU resources combined with data locality. - A demo on how a traditional application like SAP and SAP HANA can be fully containerized. - A live demo to prove the concepts and results will feature a database of 1.2 billion rows of data. The "known unknown" of Big Data in IoT: How big will your data grow and by when? IoT is at the core or many Digital Transformation initiatives with the goal of re-inventing a company's business model. We all agree that collecting relevant IoT data will result in massive amounts of data needing to be stored. However, with the rapid development of IoT devices and ongoing business model transformation, we are not able to predict the volume and growth of IoT data. And with the lack of IoT history, traditional methods of IT and infrastructure planning based on the past do not apply either. Understand key cloud concepts and how they enable your successful IoT initiative providing flexibility and elasticity to your IT infrastructure in a highly secure fashion. Join this webinar to understand how the two trends of cloud and IoT are better together. The industry is abuzz about containers, microservices and hybrid/multi-cloud environments, leaving many asking “What about my existing applications that live on-premises?” This question is top of mind for IT leaders looking to modernize their applications. The challenge is that “modernization” is usually a code word that means costly, complex and time-consuming — but it doesn’t have to be this way! - HOW: Your traditional applications can benefit from containers and cloud infrastructure. - WHY: You can realize significant benefits without disrupting your business. - WOW: See a containerized SAP Hybris on a containerized SAP HANA in action, live! We will present and demo for 25 - 30 min max, leaving ample time for your questions. Also, we will give away three high value pilots for qualified attendees. - Understand the broad range of certified SAP infrastructure provided Microsoft Azure. - How SUSE Linux is quickly becoming the default Linux open source operating system on Azure. - How Ocean9 provisions highly secure, and available high-performance SAP-as-a-Service solutions in minutes.